Let’s give a big round of applause and a thank you to Jeff from Home Repair Tutor for his tutorial on Changing Your Garage Door Extension Springs. 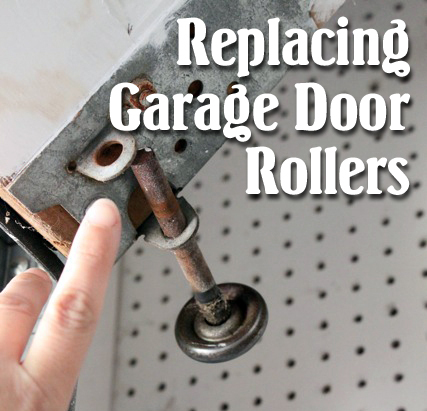 Today I’ll help you learn how to replace your garage door rollers! After that, with a little maintenance, your garage doors should continue to operate smoothly for a while. Start by opening your garage door completely. Place a clamp on to the track about 2/3 of the way up the door opening. Release the garage door from the power opener by pulling on the attached release rope. For added safety, unplug the garage door opener from the outlet. Near the top of the track use pliers to bend the track slightly open. Line up the first roller with the opening. Use the flathead screwdriver and wedge it between the roller and the track. Pry the roller out of the track. Slide a new roller in and insert the roller back into the track. Roll the door down to the next roller and repeat the same process for removing and replacing the rollers. When you have replaced the bottom 4 rollers, you’ll realize that you won’t be able to replace the top one because it won’t line up with the opening in the track. Bend the track back into alignment and then roll the door all the way open. Bend a section of track in the middle of the overhead section. Pry the last roller out and replace it. Use your pliers to bend the track back into shape. Remove the clamp from the track. Plug the door opener back in. Re-attach the door to the garage door opener by pressing the button that controls the operation of your door (usually on the wall of your garage.) The door should automatically re-attach to the opener. Close the door and watch for any misalignment of the track. If you need to adjust the tracks, loosen the bolts on the side of the track and re-align the track. I used a prybar to give a little leverage to move the track small increments. Tighten all the bolts. While you are at it, make sure all screws and bolts on the garage and the tracks are tightened because the vibration of the door can usually shake things loose over time. For more maintenance tips on keeping your garage in tip top shape, check out Home Repair Tutor’s post on garage door maintenance. I would like to make some comments on this roller replacement process. I say this because every garage door/overhead door will vary. Make sure the door is balanced properly, meaning it will hold istelf in place when lifted by hand without the operator connected. Next, make sure the horizontal track hardware is rigid and secure. I DO NOT recommend taking ANY overhead door out of it’s track or components that hold it in it’s track while the door is above your head. That’s very dangerous. Even if it’s only one roller. You can be killed or seriously injured if the rest of the door falls out due to faulty mounting and hardware systems. You really need to know what you are doing and the condition/situation will dictate how you will proceed. I have worked on doors that were horizontal in the tracks(rolled up), and it was while a come along or other means was used between the tracks to secure the system until the door could be rolled back safely down into the opening. And then dismantling of components can be carried out. It isn’t necessary to disfigure the track to remove any roller EXCEPT the roller installed in the bottom fixture. That is just a waste of time. Remove the hinge/roller assembly, with the door down safe, closed and then replace the hinge/roller. At this time you will also be able to tell if the hinge badly worn is also needing replacement. It’s better to lift/roll the door till the latch locks into the operator drive catch. A few things can happen by letting the opener re-latch the emergency release. 3: both 1 and 2 happen, and the door runs away from you out the back and onto the floor and onto people or things or, the door may fall back closed too quickly, and depending on how tall/heavy the door is, this can damage the bottom panel, pull the track off the wall, yank the cable assembly apart turning it into a lacerating metal whip, and also shatter the windows once impacting the ground. In this respect, it is much better to operate the door manually do have full control of the door’s travel in the event something is going wrong. Liftmaster openers when initiated will only reverse on the second button press rather than stop in motion, which can cause even more problems if something is stuck. This is specific in your illustration because it is a wood door, uses a stretch spring, and has glass windows. I know, because I’ve seen it happen. I’ve been in the garage door business for over 30 years and I’ve never removed the hinges to replace the rollers. It’s a lot easier and quicker to bend a portion of the track out the way the author of this article did. The only time I remove anything is when replacing the rollers on the adjustable top fixtures-you can remove the adjustable sliding portion. I always bend the track out slightly below the junction between the vertical and horizontal track. I’ve trained my techs to do the same also. We also have a special tool that allows us to bend the track back into its original form when we’re done replacing the rollers but a hammer will do if you’re DIY. I have never seen the opener trolley break or jam by running the opener to to reconnect the door. Ever. Not even on the lower end models that have a plastic trolley. On LiftMaster/Chamberlain/Sears units, a lot of times, homeowners accidentally leave the trolley on lock-out mode (prevents the opener from re-connecting to the door) and the opener won’t re-engage. Sometimes the door will move when they run the opener but it won’t re-engage and thus they assume the trolley is jammed or broken when in actuality they just have it in lock-out mode. Though I prefer to manually re-engage the door myself, there’s no harm in running the opener to re-connect the opener. The door won’t roll out at the back of the horizontal tracks either because 1) the door and opener won’t travel that far 2) most installers install (or at least they should) a stop bolt at the very end of the horizontal tracks to prevent the door from going too far. A properly balanced door won’t slam closed (or fly open for that matter) no matter how heavy the material is because the springs will be doing all of the lifting power, not the opener. I have seen several cases where the door slammed closed and the bottom section was ruined. This is often the case on double car doors with a single spring that just broke or when the spring tension is way off and the door is very heavy. But I’ve also disconnected doors from the open position due to power outages, opener malfunctions, etc. and the door only drops a few inches, which is normal. Either way, always make sure the opening is clear of any kids, pets, valuables, etc. when disconnecting the door from the opener. In my experience, I have never seen the track pulled away from the wall even if the door slams down. Perhaps the track can be pulled away if it wasn’t properly mounted to structural members in the garage. Nor have I seen the cables break from the door slamming down. The only exception would be broken cables on single spring doors when the spring breaks. All doors should travel smoothly along the tracks and should not bind anywhere. The door should remain in place at roughly the half-point of travel. It should be easy to lift with one or two fingers and should not require a lot of effort. The door should not slam down nor should it fly open. If the door is not operating properly, then the opener will have a hard time and can cause premature wear on the internal parts inside the opener. It’s best to contact a garage door technician if your door feels too heavy or too light or if it binds. I don’t recommend trying to adjust the spring tension yourself if have never done this before. Just my two cents. In my opinion, the author of the article did a great job replacing the rollers on her garage door. I have a roller that pops out all the time and then sometimes it gets caught and won’t let the door open all the way. Any idea how to fix that? Kevin, have you tried replacing the rollers? Otherwise, you might need to look at the track and see if there are adjustments that need to be made. Firstly, good work getting it fixed. 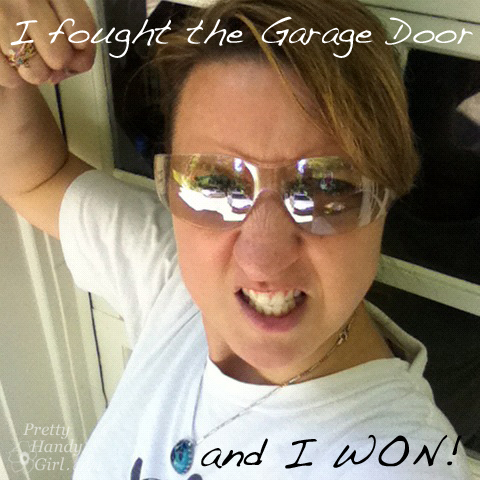 I have been rigging my garage door for four years now, but sadly I think it is time to say goodbye. the sheet metal is tearing around the hinges, and while I have braced many with blocks of wood, It is just not holding up. I notice that some of your photos looked like they had different doors and hinge styles. Which is a little distracting, but I get it, if you did not get the photo you wanted during the repair. Anyways, unless your door is stuck in the up position, I also never recommend working on it above your head, as others have mentioned. Besides it possible falling on your head, it is just easier to work on it in front of you, instead of above you. Might I suggest instead of bending the track to pop the rollers out, removing the hinges from the door via the bolts. The rollers come right out of the track is you pull the hinge end toward you. But only do this is the door is in the down position. i really like your hard work , good job guyz! If you have a home you more than likely have a garage. The problem is that most people will treat the garage area like a stepchild when it comes to home maintenance and in time it can prove to be quite costly. Here’s an interesting little tidbit and something you probably didn’t know. Did you know that your homes largest moving part is the garage door, in most all cases? For almost all homes this holds true. And if you don’t take care of it, all those moving parts can stop working with time and wear. Myself, I would never use pliers to tighten nuts. That is a good way to round them off. Box or open end wrenches or sockets for nuts and bolts will keep them usable.